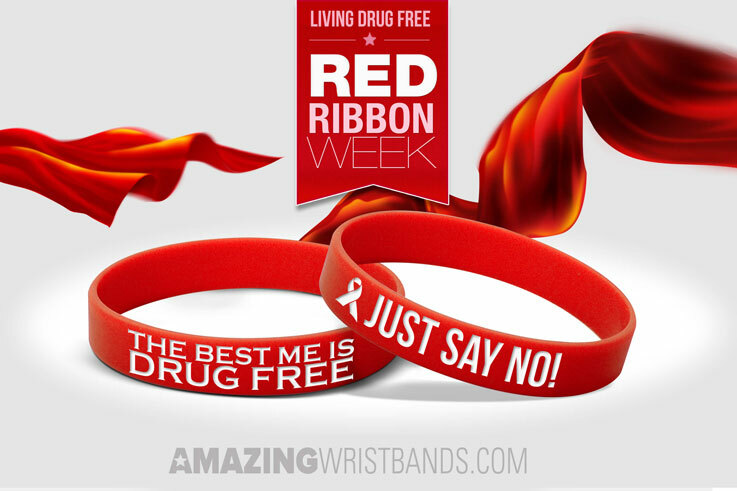 How To Promote Red Ribbon Week With Wristbands? Red is one of the most popular colors, and is used for many different things. Every color has a special meaning. Custom silicone wristbands in red color are used as awareness tools for many different causes. You can create customized red bracelets to raise awareness for causes such as AIDS and HIV, heart disease, drug abuse prevention, stroke, Epidermolysis Bullosa, and Reflex Sympathetic Dystrophy. What do Red Wristbands Symbolize? At AmazingWristbands.com, you can create custom red wristbands for many uses. To make your red bracelets unique, use a second color as an accent or add glitter, swirl, or segment effects. 100% silicone wristbands that are non-allergenic and latex free. We never supplement our silicone products with fillers such as latex. Our wristbands come in a variety of sizes and widths, including half-inch bands, thicker one-inch bands, and adjustable wristbands. We also offers popular slap bands that “snap” to a person’s wrist, USB bands, silicone rings and silicone key chains. Create your red bracelets for red ribbon week today!